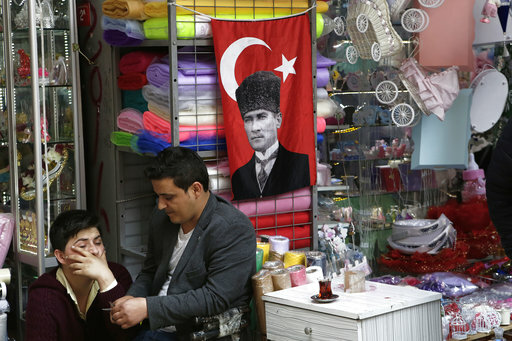 ANKARA, Turkey (AP) — Turkey’s main opposition party on Monday urged the country’s electoral board to cancel the results of a landmark referendum that granted sweeping new powers to the nation’s president, citing what it called substantial voting irregularities. On Monday, Erdogan slammed his critics at home and abroad. “There is only one way to end the discussions about the vote’s legitimacy and to put the people at ease, and that is for the Supreme Electoral Board to cancel the vote,” Tezcan said. He said it was not possible for authorities to determine how many ballot papers may have been irregularly cast. “The ballot papers are not fake, there is no (reason) for doubt,” Guven said. Tezcan said any decision that changes Turkey’s political system to such a vast extent should have been passed with an overwhelming endorsement. The new presidential system takes effect at the next election, currently slated for 2019. Other changes will take effect sooner, including an amendment that scraps a clause requiring the president to be impartial, allowing Erdogan to regain membership of the ruling party he founded — or even to lead it. “Even though I choose “no” and the results came out “yes,” I wish the best to our country,” he said. In Istanbul, accountant Mete Cetinkaya was worried about his country’s future.